The section of Jetty Road in the vicinity of the Clifton Springs Primary School continues to pose a threat to cyclists and walkers, despite recent road works. 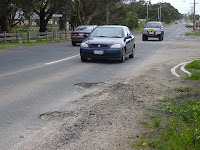 In response, potholes have been filled-in and road edging improved. 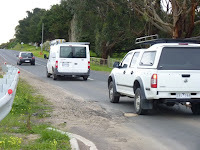 Bouquets to the City of Greater Geelong for doing the work; buckets to the council for taking months to do it, for leaving dangerous loose surface gravel that could still injure walkers and cyclists and for leaving in place the dangerous 1.5m section of footpath. It is clear that without the campaign by DCSCA and the Primary School, this junction would still be dangerous to walkers and cyclists. Decent, respectful consultation with local people would have shows precisely what needed to be done to create a safe junction. Why should local people have to fight for decent, safe infrastructure when developers are spending millions of dollars to create the new housing estates in Jetty Road - allegedly under the supervision of the council's planners?